Edinburgh is a city overflowing with art galleries, although the majority operate on a purely commercial basis, being especially clustered along Dundas Street. 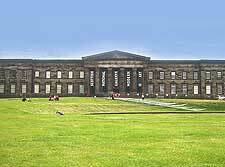 Those in Edinburgh who favour permanent collections of art work spanning past centuries are strongly advised to pay a visit to the National Gallery of Scotland, where famous artists are in good supply. The Scottish National Portrait Gallery on Queen Street is also extremely popular and has recently enjoyed much refurbishment, while the Edinburgh City Art Centre on Market Street and the Deal Gallery on Belford Road are equally noteworthy. 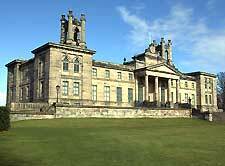 Also located on Belford Road is the Scottish National Gallery of Modern Art, which is home to a plethora of contemporary paintings and sculptures, where distinctive Rennie Mackintosh pieces and Henry Moore sculptures are a particular highlight for many a visitor. Sharing the Mound with the Royal Scottish Academy (RSA), the National Gallery of Scotland occupies a palace-like building dating back to the late 1850s. Celebrating both Scottish and European art, the National Gallery boasts an enormous archive of more than 30,000 drawings and paintings, together with an exhaustive research library now containing in excess of 50,000 books and documents. When it comes to artists, names include the likes of Bassano, Cézanne, Constable, Da Vinci, Degas, Drummond, Gainsborough, Monet, Poussin, Rembrandt, Rubens, Titian, Van Dyck and Van Gogh. Home of both the national collections of Scottish Portraits and Scottish Photography, the Scottish National Portrait Gallery resides on Queen Street, where it is easily recognised by its distinctive red-sandstone facade and Gothic revival architecture, which was inspired by the Doges Palace in the Italian city of Venice. This vast collection was initially established by John Ritchie Findlay (1824 to 1898), the owner of 'The Scotsman' newspaper, who generously donated his portrait paintings to the nation and funded the construction of this purpose-built gallery. 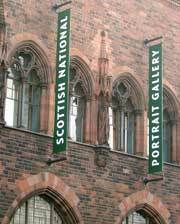 Opened in 1889, the Scottish National Portrait Gallery continues to draw the crowds today. Located close to the National Museum of Scotland and the Bedlam Theatre, the Matthew Architecture Gallery resides within the Old Town area of the city and is without doubt Scotland's most important exhibition venue for architecture. With many exhibitions throughout the year, often featuring displays by world-famous architects, the Matthew Architecture Gallery also displays the work of architectural students from Edinburgh University. This commercial, contemporary venue features a wide range of different modern works of art, by both local Scottish and international artists. Housed in an impressive Georgian townhouse, the Bellevue Gallery hosts a number of important events and previews throughout the year. Nearby attractions are in good supply and include the Queen Street Gardens, the St. James Shopping Centre and the Scottish National Portrait Gallery. The Edinburgh City Art Centre is housed in the former offices of the Scotsman Newspaper, in a grand building that dates back to the late 19th century. Attractions include an eclectic mixture of art work, such as modern photography, fun sculptures and stylish paintings, as well as a popular café and an art-related gift shop. The Collective Art Gallery is situated in the Old town area of Edinburgh, within the Princes Street Gardens, and was founded in 1984. With numerous exhibitions of modern art, lively sculptures and a multitude of handicrafts, many local artists regularly exhibit here. If you have time on your hands, you will find that St. Giles Cathedral and the Writers Museum are both within easy walking distance, while close by is the Royal Scottish Academy and the Scott Monument. The Dean Art Gallery is housed in a historic hospital building, in the heart of the city. Opened in 1999, attractions here include enormous sculptures, paintings, a coffee shop, attractive grounds and a surprisingly modern, stylish interior. Located on the western side of the city centre and just off Lady Lawson Street, the Edinburgh College of Art is one of the best galleries for new talent in Scotland. Attractions at this commercial venue include acclaimed degree shows during June, paintings, sculptures, ceramics, glass, textiles and jewellery. The Di Rollo Gallery is situated on Dundas Street, where it is housed in an attractive Georgian townhouse. Established in the early 1960s, the Di Rollo features an extensive selections of oil paintings, watercolours and contemporary works of art, many by leading Scottish artists. The highly regarded Fruitmarket Art Gallery is one of the best contemporary venues in the whole of Scotland and is situated in the centre of Edinburgh, next to Waverley Station and just a stroll away from the Dungeons. Converted into an exhibition space in 1992, the Fruitmarket features art work by new Scottish and English artists. 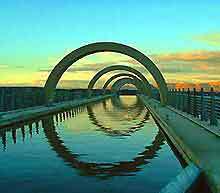 The Fruitmarket operates on a not-for-profit basis and is registered as a Scottish charity. Hanover Fine Arts ranks amongst the most popular commercial art shops in the city and always has an extensive collection of contemporary pieces on display. Located in the New Town area of the city, Hanover Fine Arts features numerous paintings, sculptures, ceramics, textiles and jewellery, with around ten exhibitions every year. 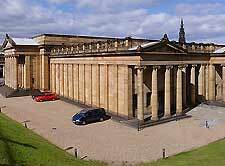 Standing within the New Town area of the city, the Scottish National Gallery of Modern Art is one of the most important of its kind in this part of Scotland and was founded in 1984. Housed in the former John Watson School, which dates back almost 200 years, the National Gallery of Modern Art boasts a number of different exhibition rooms. Highlights include watercolours by Rennie Mackintosh, and many paintings by world-famous artists such as Bonnard, Kirchner, Magritte, Matisse, Miro, Picasso and Vuillard, amongst others. Additional attractions include a café and a large museum shop. The Nexus Galleries is situated behind the Usher Hall and the Traverse Theatre in the Old Town area of the city, part-way between the city's College of Art and the International Conference Centre. With regular exhibitions, including work by local up-and-coming artists, this commercial gallery has many popular shows throughout the year. Edinburgh Castle is especially nearby, as is the Royal Lyceum Theatre and the Odeon Cinema. Close to St. Stephen's Centre and the Scotmid Co-operative Society, the Edinburgh Patriothall / WASP Art Gallery is a popular venue in the New Town area and features many excellent works of art by emerging Scottish artists. Situated on Rutland Square, within the New Town area, the RIAS Art Gallery features a number of exhibition spaces where you will find photographs, paintings, themed-displays and drawings. Founded in 1826 and located in its present venue since the early 1850s, the exceptional Royal Scottish Academy is situated in within the city centre, next to the National Gallery. This impressive neo-classical building was built in the early 19th century and now houses many important works of art, including a multitude of excellent watercolour paintings. The Scottish Gallery was established in 1842 and remains Scotland's oldest commercial exhibition space, being located in its current building on Dundas Street since 1993, next to the Queen Street Gardens. This popular venue features many excellent contemporary paintings, sculptures, ceramics and jewellery.